When someone leaves a comment on your Blogger blog, his name is linked automatically into his website or profile url. But if you do not want to give links to their websites from your blog, follow the steps given below to remove author URLs form Blogger comments. First backup your Blogger template before doing any changes. 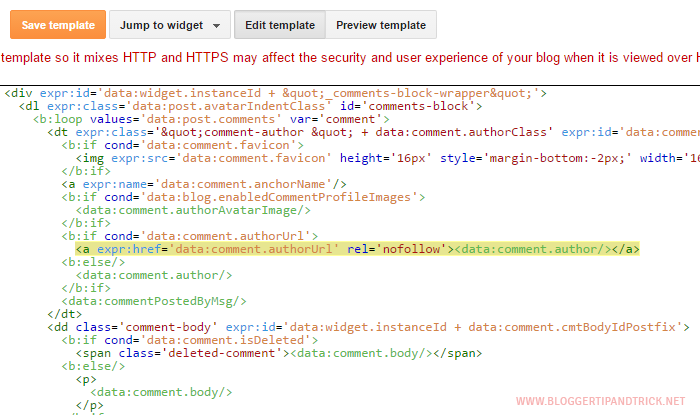 Now go to "Edit HTML" page of your blog. Save your template. Now when someone adds a comment to your website with his site URL, Blogger only shows his name without linking to his website.